The ultimate free useful software reviews blog to track all kind of software related stuff. A part time blogger who blogs for the purpose of learning and sharing. All information in my blogs are solely from my personal views or experiences. Have you ever wondered why your web browser always hangs when you enter the wrong URL address? The reason is your web browser keep looking for the IP address of the URL from the DNS server but the IP address cannot be resolved. As long as you type in the URL address (e.g. www.google.com), the DNS server will try to resolved it to the actual IP address (e.g. 64.233.181.104). Therefore if your DNS server's respond is low, it takes longer to resolve the IP address and eventually this causes your overall internet connection becomes slower. Usually people will suggest you to use the Google DNS server (i.e. 8.8.8.8 or 8.8.4.4) as it is believed the fastest DNS server. Is that true? The "namebench" is the software / freeware to tell you to the answer! Install for Windows or Mac version. Run the application and you will see the following screen. Let's everything to be default (it detects your location automatically). If the location is not correct, you can change it. Click "Start Benchmark". 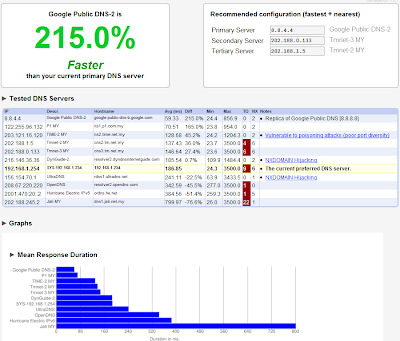 As you can see from the result, the Google Public DNS is 215% faster than my default DNS server. That is really awesome. Google rocks! For preferred DNS server in Windows, put the suggested primary server by namebench. 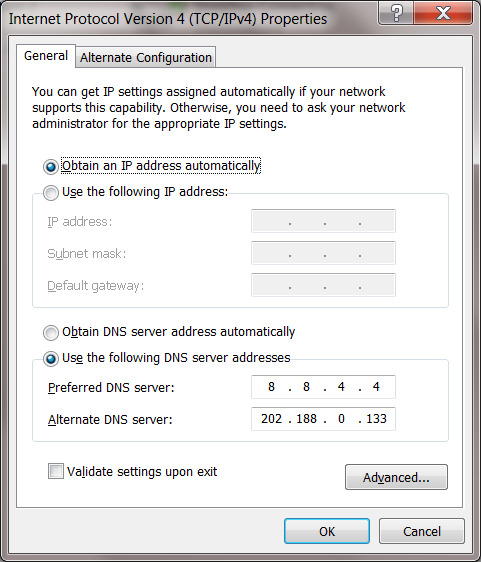 For alternate DNS server, put the suggested secondary server by namebench. If you connect your PC or laptop through both LAN and Wireless network, you need to apply the setting to both network(i.e.Wireless and LAN). Basically you need to apply the setting to each of the network (i.e. wireless, LAN and dial-up connection). Unable to Remove or Delete Folder due to Outlook Synchronization?